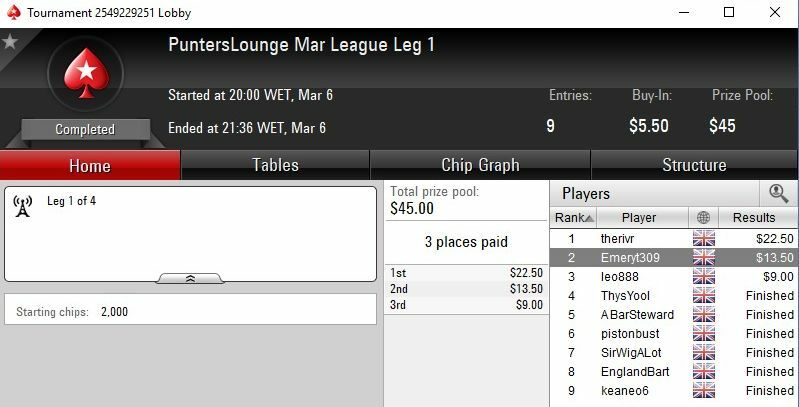 The Punters Lounge £150 added Poker League springs into March this week. All games are played in the PokerStars Home Games PL Poker Club. This month will feature a PLO leg in week 3 with the other 3 legs NLHE. 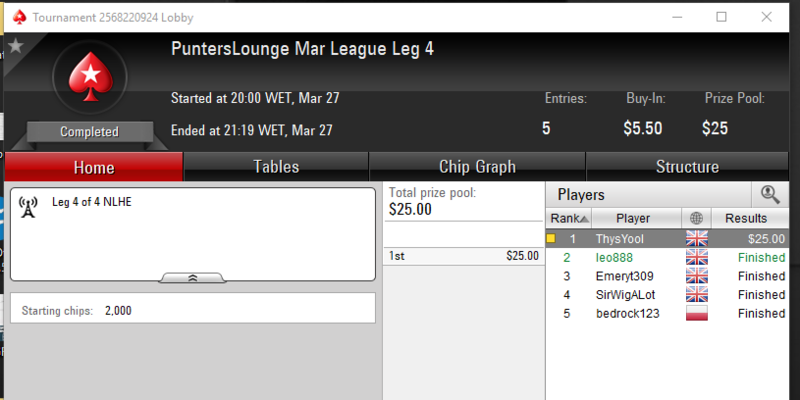 Leg 1 : Wednesday 6th March at 20.00 GMT in the PL Poker Club Home Game. Buy in is $5.50 per leg. All members are welcome, however you must post in this thread if asked to let us know your forum username, otherwise your placings and scores cannot be included in the league. Please spread the word and invite your friends so we can get the weekly numbers to keep this league viable. New players always welcome to join in. Well done to Rivrd taking the first leg of the new league. Leg 2 set up and registering now. 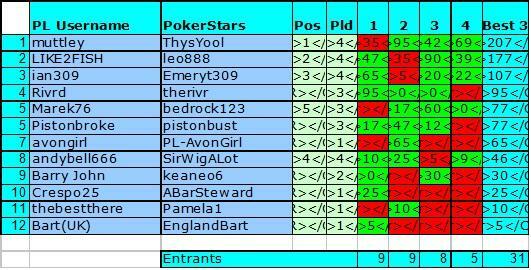 Well done to muttley our leg 2 winner and new league leader. 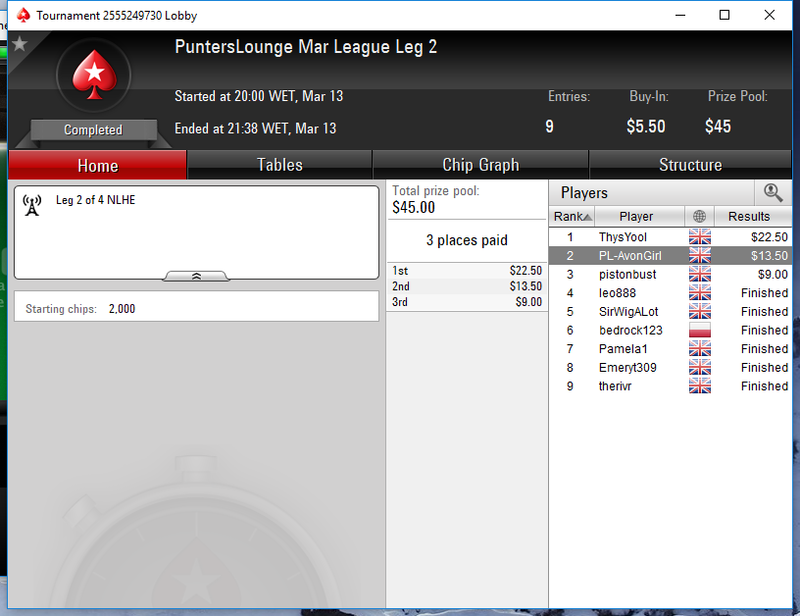 3x second places for me now this year, think I need to practice my HU! Next week we have our PLO leg, so hope to see a good turnout for 3000 chips worth of excitement! Game is set up ready. Well done to Leo, the win draws you alongside muttley up at the top of the league. Hope everyone enjoyed the Omaha leg but it's back to NLHE for the final leg next week. Looks like a tight finish on for all the podium places. Will there be a game on the 10th April? looks like I can make that Wednesday. Good game all,wp champ Muttley! Thanks to Punters Lounge for supporting this, and to everyone who took part this month. The turnout was a little disappointing tonight, probably because 1st and 2nd were pretty much sown up. Andy made the suggestion that the last leg should be double points, and I would support that, or similar, if it made it more competitive. Unfortunately, I won't be able to play for the next two legs, as I'm in Vegas. (Obv brag). Good luck all! GL in Vegas, have fun I would like to go again 1 day! Leo and Ian in 2nd and 3rd also ending the league in those podium positions. Thank you to all who turned up this month. Invite a friend for April and let's get the weekly numbers up to keep the league competitive. Payments are normally processed together for all our monthly competitions around 14 days after the end of the month. Sounds like a good idea and spices things up a bit. Sorry was rushing to get the final results up and missed replying to this. Am happy to give it a go and see what support it gets and if it makes a difference to results and numbers. Errrm x2 in the last column.